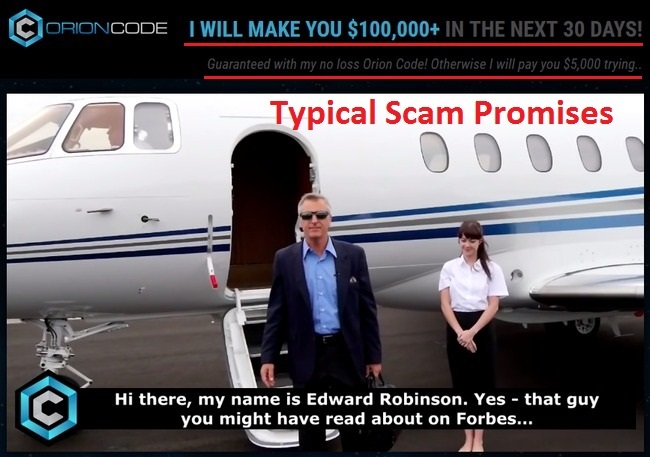 Orion Code by Edward Robinson claims to be a miracle trading software that is guaranteed to make $100,000 in a month. However, none of my readers made a penny with the system. In this Orion Code review, I will show you how it works, what happens when you sign up for the software, and why you should avoid the scam like a plague. I’m sure you’ve had your doubts when you watched the sales video for Orion Code trading software. It’s full of typical promises of a scam, yet there are victims falling for it every single day. For a start, you should be careful the moment you see what Edward Robinson is promising with his Orion Code software. He guarantees to make you $100,000 in the next month, or he’ll pay you $5,000 for just trying. What are his motives? Why is he practically giving free money to complete strangers? Check out what happens to my readers who unfortunately fell for the scam. Once you activate the auto-trading feature, you give the software full control of your trading account. Instead of making winning trades, the software takes random trades that inevitably deplete your trading account. The same scenario has happened to a few other readers of mine. Unfortunately, you can only request a withdrawal on the money left in your trading account. Money lost to trading cannot be retrieved, because it’s considered trading loss. With that said, there are actually ways to detect a scam without having to pay for it. Below, I’ll reveal some tricks used by Orion Code scam that can help you steer clear of the fraud. Let’s start with the “founder” of Orion Code software, Edward Robinson. He claims to be a renowned millionaire trader who was featured in Forbes, but evidence says otherwise. He was actually hired to promote another scam called The Amissio Formula, which I have reviewed earlier. In that particular scam, he introduced himself as Craig Phillips instead of Edward Robinson. 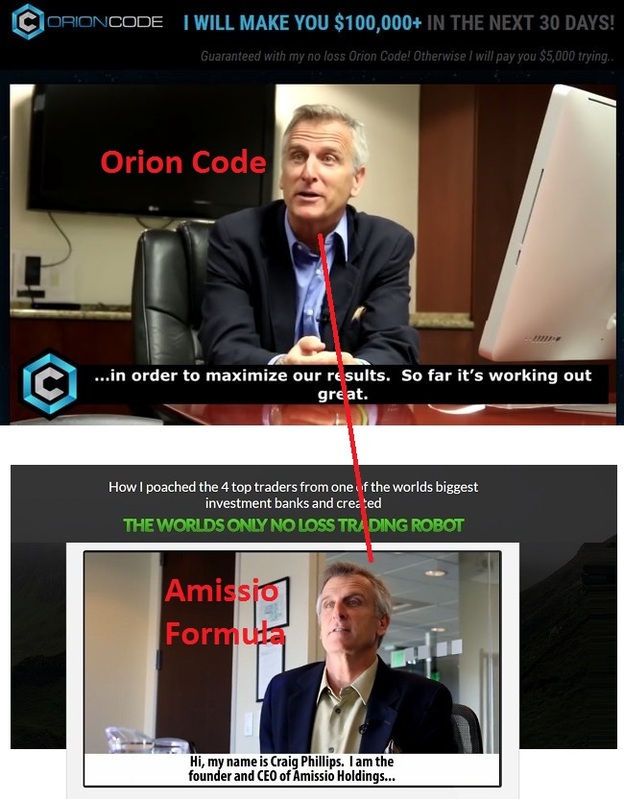 Similar to Orion Code, The Amissio Formula promised to make huge profits for its members, only to lose all their trading deposits in a matter of hours. In fact, this man is a professional actor that was hired again and again to promote different binary trading software scams. There is no miracle trading software, and those that claim to make you free profits are just eyeing on your deposits. Did you notice anything interesting with the timer? Right below the sales video, there’s a countdown timer that shows the time left before memberships are completely closed. In other words, you have to sign up before that to get a copy of Orion Code software. If you look closely, you’ll realize that the timer never goes below 34 minutes. As soon as it hits 34:00, it resets to 35:00 and continues countdown from there (GIF above). You can wait forever and the memberships will still be open. Again, this is another trick by the scammers to fool you into signing up for it. There are no limited spots to begin with. Below their sales video, we can see multiple member that allegedly made huge profits with Orion Code. Take Shannon Copare for example. 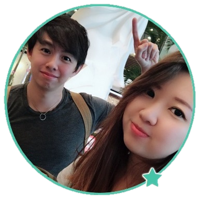 According to her profile, she made more than $500,000 profits with just a starting deposit of $500. However, a simple reverse image search disproved their claim. The picture was stolen from a website owner called Jennifer Matthews, and she has nothing to do with the scam (screenshot above). The rest of the members are found to be fabricated using pictures stolen from all over the internet. Don’t fall for this trick. No one has made money with Orion Code software, as you will find out in the evidence below. 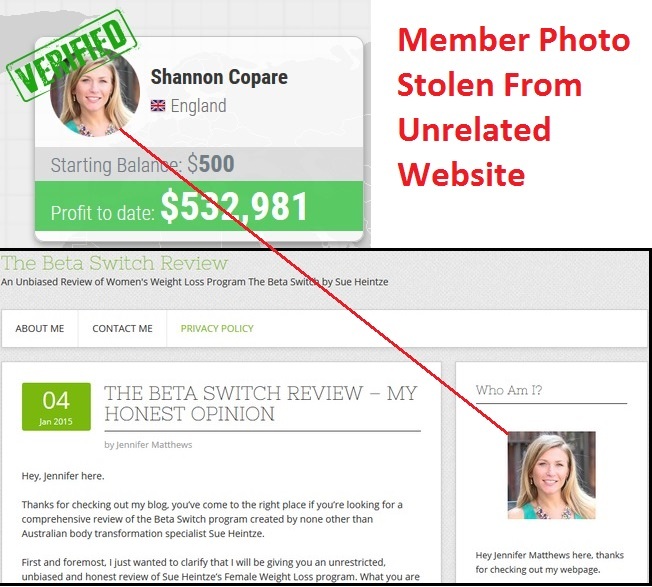 As much as the scammers want to keep you in the dark, they have to reveal the true nature of the scam somewhere in their website to protect themselves from lawsuits. They chose to hide the truth in the disclaimer document, which can’t be found anywhere in the sales material. You can only access it through a fine print that reads “disclaimer”, located at the bottom of the sales page. Check out this URL for their original disclaimer: theorioncode.com/terms. Despite coercing you to sign up for the “free” money-making software, Orion Code denies inviting you to trade binary options. Note: Frauds that promise unrealistic returns like Orion Code are illegal in many jurisdiction. If they do not include this clause, they are deemed to illegally coerce you into signing up for the scam. Orion Code admits that trading binary options is extremely risky, and it’s your own responsibility if you decide to sign up and lose all your investments. NO REAL TRADES HAVE BEEN EXECUTED using Orion Code software. All profits quoted in the sales material are fake. From clause (3) alone, we found that none of the profits advertised in the sales material is real. In fact, no one has made real money with the software, at all. When you register on Orion Code website, you are actually registering for an unregulated broker account, which is affiliated with Orion Code. Once you fund your trading account with at least $250, the software starts making automated trades on your behalf. The losses are pocketed by the broker, which is then shared with its partner-in-crime – the scammers behind Orion Code system. In the end, victims who sign up for the scam lose all their deposits in this complicated fraud, while the scammers make a handsome profit with the trading fund. ORION CODE IS A SCAM. I strongly advise you to stay away from the scam if you don’t want to lose your hard-earned money. Have you encountered any online scams before? Personally I’ve fallen for a few before coming across the legitimate one, so write it down in the comments below if you have any personal experience to share! Cloud Track Trader Review – It Won’t Make You Money! Thanks for sharing this important information. I will stay clear of the orion code and inform every person that I know to also stay clear from this invitation to waste their money. I was tempted at first about the idea of making moneybut after digging deeper into available online information I changed my mind. Hit the scammers where it counts, inform the masses not to fall victim to the old crime. Glad you found it helpful. Online scams are everywhere, gotta exercise caution and think it through before you pay for any business opportunities.